I have recently installed Ubuntu 14.04 LTS on my laptop Sony Vaio VPCEA16FG. I have been getting system freezes (everything including display, mouse, keyboard stops working and I have to do a restart with the power switch) and there are random popups of "System program problem Detected" On startup my screen is all splashed with black and white pixels and a System program problem detected message. Your screenshot is displaying repeating patterns of video artifacts which are characteristic of video RAM artifacts. If the RAM in your graphics card is failing, sometimes just a small fraction of the RAM goes bad while the rest of the RAM continues to work properly. This can result in a screen that looks like a fraction of the screen has glitchy, repeating patterns of video artifacts, while the rest of the screen is rendered properly. 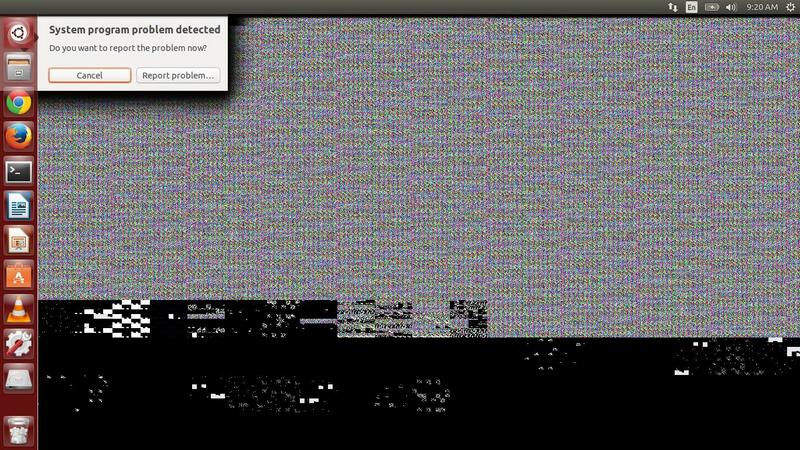 This command will identify the recommended proprietary graphics driver from the default Ubuntu repositories. Test if the visual artifacts also occur in situations that require a lot of video RAM, for example while browsing and playing a YouTube video in Firefox. If your graphics card is removeable, temporarily remove it in order to check if the graphics card is causing the glitchy, repeating patterns of visual artifacts. Graphics cards that are intended more for ordinary day-to-day use than for gaming are relatively cheap to replace. Read the answer to this question: What causes this graphical glitch in my web browser? which has a screenshot with a graphical glitch that looks similar to yours. Not the answer you're looking for? Browse other questions tagged 14.04 radeon freeze amd-graphics visual-artifacts or ask your own question.